If high efficiency, energy saving operation at an economical price is your goal, the latest generation Goodman GMV9 variable speed, two-stage, 93% efficient furnace is your winning choice. 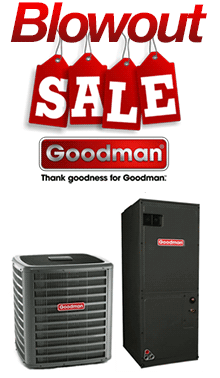 Goodman packs all the latest high-technology features into this furnace without breaking your budget. Features like the energy-saving, reliable hot surface ignition system with patented adaptive learning algorithm to maximize the igniter life. The corrosion-resistant, aluminized steel tubular heat exchanger with a stainless-steel recuperative coil will provide many years of trouble-free service. And best of all, this super efficient furnace can reduce your total energy costs by as much as 50% or more when compared to an older, inefficient furnace. The GMV9 furnace is easily converted for use with propane with the addition of the field installed LPM-03 propane conversion kit for only $99.00 (available at check-out). The Goodman GMV9 multi-position condensing gas furnace with two-stage heating and variable speed circulating blower combines exceptional value with state of the art features. The GMV9 series furnace advances home comfort by eliminating temperature swings from floor to ceiling and room-to-room. The variable capacity blower smoothly and quietly ramps up or down -- based on the demands of your home -- to maintain comfortable and consistent temperatures at all times. A variable speed furnace blower is different from a standard blower in that it features a high efficiency Electronically Commutated Motor (ECM) by General Electric. This feature is important because full air delivery is only needed a small portion of the time. During lower demand times this motor reduces its speed providing up to 4 times better humidity control in the cooling mode, better air distribution throughout your home, and greatly reduced operating costs. Better air distribution will provide a marked improvement in those areas of your home where air delivery has been a problem, such as the rooms farthest from the furnace. Another important feature of the Goodman GMV9 series variable speed furnace is the reduction of what is referred to as "cold blow," or the cold blast of air upon heating startup. "Cold blow" results from cold air that develops in the duct system while the heat is in an off-cycle. When the furnace heater fan cycles on, this cold air is moved very quickly into your home resulting in an uncomfortable draft. 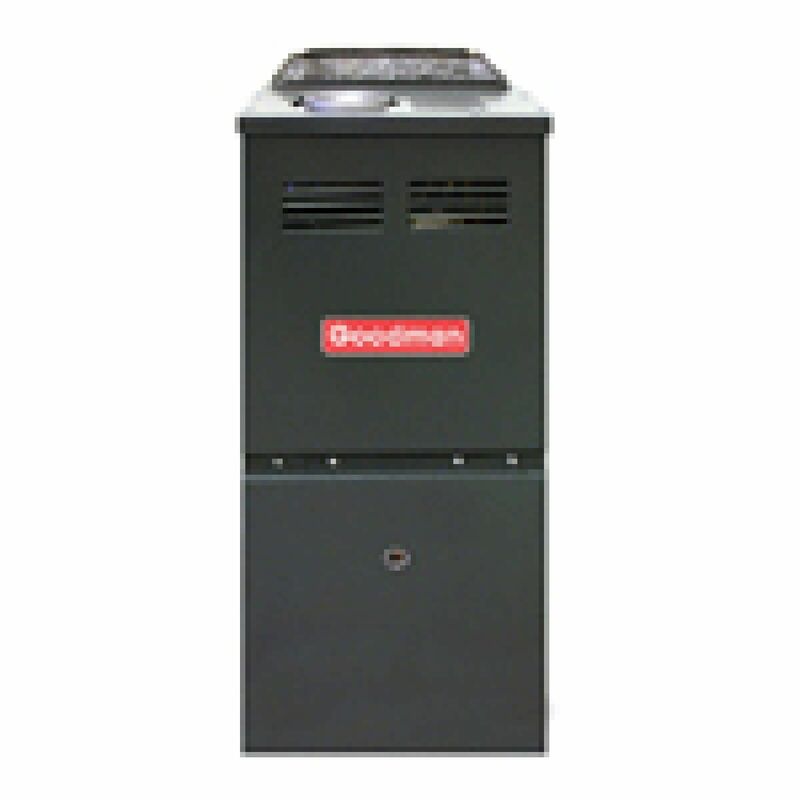 This Goodman variable speed furnace virtually eliminates cold blow with a "soft start," or a gradual increase in fan speed over the initial 3 to 4 minutes of the on-cycle. This cold air is combined with preheated air from the furnace blower and is delivered at a slower velocity until it reaches full operating temperature. The result? Improved heating comfort and a dramatic reduction of the uncomfortable drafts associated with standard furnaces. In fact, the GMV9 series variable speed blower is so efficient that the low speed constant fan setting costs about the same to operate as an ordinary 75 watt household light bulb. You and your family will appreciate the whisper-quiet operation of the GMV9 furnace. The variable speed motor is among the quietest ever made and in fact, when combined with the generously applied foil-faced insulation, this is one of the quietest furnaces available at any price. The lower constant fan speed setting allows for greater removal of impurities by your furnaces' air filter. Click here to learn more about air filtration options. The two-stage feature of the Goodman GMV9 furnace is like having two furnaces in one. On the coldest days, the furnace operates in the high-stage mode at 100% capacity. But on most days, the furnace comfortably conserves energy by operating in the low-stage mode at just 70% capacity. The GMV9 two-stage gas valve runs quietly on low stage 90% of the time, producing just 25% of the normal high-fire sound while significantly reducing energy consumption. The GMV9 features Goodman's patented, seamless, aluminized steel tubular heat exchanger and stainless steel recuperative coil for many years of dependable operation. Goodman is so confident in the design that they offer a limited lifetime warranty on the heat exchanger so you can rest easy while enjoying the energy saving comfort of your new furnace. The high-efficiency combustion process allows venting with 2 or 3 inch PVC without the need for a traditional chimney flue. And because it can be direct-vented to the outside, fresh air can be used for combustion. This is helpful if the air in the vicinity of the furnace is corrosive, such as around paint or chemical storage, and will protect the heat exchanger from the harmful effects. The fuel stingy auto-ignition system eliminates the old-fashioned standing pilot for greater ignition dependability without the wasted energy. The furnace can be installed in an upflow position (ductwork above the furnace) position or horizontally (furnace in an attic or crawlspace) or as a downflow (ductwork beneath the furnace - requires GCV9 downflow furnace) without the need for modification. Your installer will appreciate the thoughtful installation flexibility provided by the alternate top or right-hand flue venting. The convenient left or right connection for gas and electric service will make installation a snap. If high efficiency, energy saving operation at an economical price is your goal, the latest generation Goodman GMV9 variable speed, two-stage, 93% efficient furnace is your winning choice. Goodman packs all the latest high-technology features into this furnace without breaking your budget. Features like the energy-saving, reliable hot surface ignition system with patented adaptive learning algorithm to maximize the igniter life. The corrosion-resistant, aluminized steel tubular heat exchanger with a stainless-steel recuperative coil will provide many years of trouble-free service. The GMV9 series furnace advances home comfort by eliminating temperature swings from floor to ceiling and room-to-room. The variable capacity blower smoothly and quietly ramps up or down -- based on the demands of your home -- to maintain comfortable and consistent temperatures at all times. 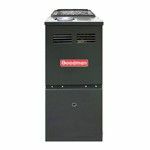 Another important feature of the Goodman GMV9 series variable speed furnace is the reduction of what is referred to as "cold blow," or the cold blast of air upon heating startup. "Cold blow" results from cold air that develops in the duct system while the heat is in an off-cycle. This is helpful if the air in the vicinity of the furnace is corrosive, such as around paint or chemical storage, and will protect the heat exchanger from the harmful effects. When the furnace heater fan cycles on, this cold air is moved very quickly into your home resulting in an uncomfortable draft. 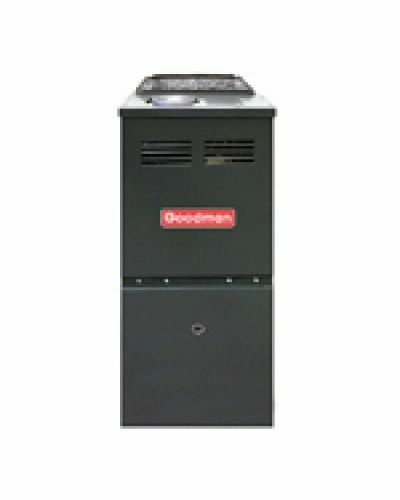 This Goodman variable speed furnace virtually eliminates cold blow with a "soft start," or a gradual increase in fan speed over the initial 3 to 4 minutes of the on-cycle. This cold air is combined with preheated air from the furnace blower and is delivered at a slower velocity until it reaches full operating temperature. Improved heating comfort and a dramatic reduction of the uncomfortable drafts associated with standard furnaces. In fact, the GMV9 series variable speed blower is so efficient that the low speed constant fan setting costs about the same to operate as an ordinary 75 watt household light bulb. You and your family will appreciate the whisper-quiet operation of the GMV9 furnace. The variable speed motor is among the quietest ever made and in fact, when combined with the generously applied foil-faced insulation, this is one of the quietest furnaces available at any price. The lower constant fan speed setting allows for greater removal of impurities by your furnaces' air filter. The two-stage feature of the Goodman GMV9 furnace is like having two furnaces in one. On the coldest days, the furnace operates in the high-stage mode at 100% capacity. But on most days, the furnace comfortably conserves energy by operating in the low-stage mode at just 70% capacity. The GMV9 features Goodman's patented, seamless, aluminized steel tubular heat exchanger and stainless steel recuperative coil for many years of dependable operation. Goodman is so confident in the design that they offer a limited lifetime warranty on the heat exchanger so you can rest easy while enjoying the energy saving comfort of your new furnace. The high-efficiency combustion process allows venting with 2 or 3 inch PVC without the need for a traditional chimney flue. And because it can be direct-vented to the outside, fresh air can be used for combustion.